Bounce Rate is a very important metrics. Learn all about Bounce Rate of a blog / website and discover the ways of how to decrease this rate to gain more page views and user engagement. More often than not, newbie webmasters and bloggers do not feel concerned about a piece of data called the Bounce Rate. All the web traffic analysis tools worth their salt will tell you the bounce rate of your website or blog. And you must pay attention to it. In this article I am going to explain everything about bounce rate, including ways of how to reduce it. Bounce Rate refers to the percentage of your website’s visitors who come and read only one page on your blog. This is to say that a visitor comes on one of your posts and leaves your blog after reading that particular post. Such visitors do not spare time to roam around in your blog and read more posts. High bounce rate can provide a hint that your blog is not catchy enough to entice a visitor’s interest beyond the post where he had landed. Don’t let visitors to bounce off from landing page. How to Calculate Bounce Rate of Your Blog / Website? Ok, now that you know what is bounce rate, let’s see how to calculate it. It’s very easy indeed! Thus, if you have 200 visitors in a day and if 170 of them left without going to any other post —then the bounce rate of your website is is 85% … meaning 85% of your visitors did not bother to explore your website further. Well, 85% is very high bounce rate! As I said before, any good web analytics software will automatically calculate and show you the bounce rate. You must use a good web traffic analysis tool for getting the insights into what’s going on your website. Why Is Your Blog’s Bounce Rate High? If your content is badly written or factually wrong —the visitor will immediately leave your blog (and perhaps will never come back!). Make sure that you write useful, helpful and interesting content in a language suitable for a good blog. If your blog loads slow, I can bet that visitors will leave it sooner than you expect. Online visitors are not patient people. If your blog takes more than 5 seconds to load, you can be sure that you are losing a significant number of page views just because of speed issues. If your content is not about what it claims to be —visitors will get annoyed. Many novice bloggers use such black hat tricks to get traffic but eventually they pay a heavy price. Your blog must have a clearly laid out, easily found and visible navigation scheme. If you don’t have a good navigational structure, your visitors will not be able to find their way to the other areas of your blog. Blog’s design should be simple. Links should be clearly visible against the background color. For example, grey color links on black background is not a good idea at all. You should not use stuff like moving items (like marquee, animated gifs, flash etc.) and popup windows too much. These things irritate visitors as they find it difficult to focus on the real content of your blog. What Bounce Rate is Ideal? There is no perfect answer to this question. 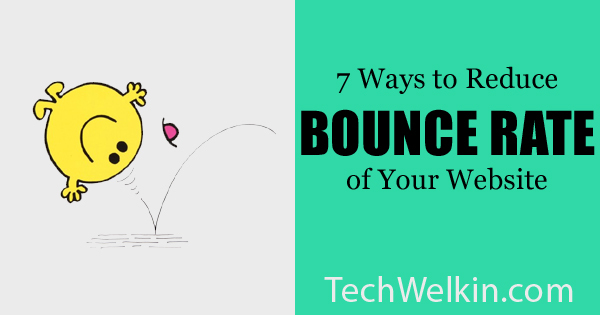 Different blogs and niches have different bounce rates. For example, news websites will have very low bounce rates because readers do come to these websites to read multiple news items. In contrast, a question-answer website will have relatively high bounce rate because visitors are most likely to leave the website after getting the answer they were looking for. Nevertheless, an average bounce rate of 60% could be seen as an ideal rate for most of the websites. Even lower the better! So, I would recommend that as your first goal, you should aim to bring the bounce rate down to 60%. After that, you can go on reducing it even further. Low bounce rate translates into higher revenues if you’re displaying advertisements (Google AdSesne or any other ad networks). So far as we talk about ads, a new visit or a new page view are equally good. Lower bounce rate > higher page views > higher number of ads displayed > higher likelihood of clicks. You should take measures to reduce the load time of your blog. A slow loading website is something that makes bouncing a certainty. Different websites have different load times depending upon the kind and amount of content it offers. But, trust me, you can always do something to speed-up your blog. Just look for what is causing slowness. It is important for any serious blogger to reduce bounce rate to as low as possible. However, one must not go overboard in playing tricks as it may spoil the whole dish. This article explained all about bounce rate. Now, following is an infographic from KISSMetrics that says a few more things. Do, please, let me know your comments and questions. Reduccing bounce rate is an important goal that every blogger should try to get to. Feel free to comment and share with me your questions and suggestions. Thank you for using TechWelkin! My website has a bounce rate of 68%. How to reduce it? Your article is very useful and informative . I will try it on my blogs .